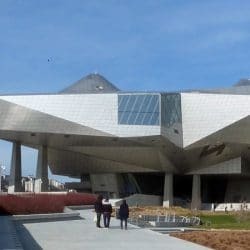 Facing the rising sun and the Alps, way up over the Confluence of Rhône and Saône, the Museum of Gallo-Roman Civilisation chronicles five centuries of the city’s history under Rome when Lyon was known as the dazzling capital Lugdunum. 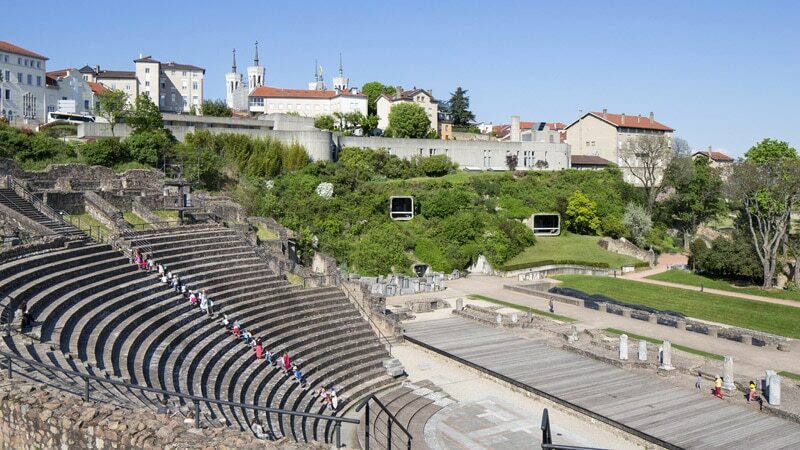 Dug deep inside Fourvière hill in the 5th district of Lyon, with its two huge windows overlooking its neighbouring Amphitheatre and Odeon, the Gallo-Roman Museum of Lyon is akin to a submarine, set to journey through the undergrowth and vestiges of this ancient civilisation. Step on-board and be subtly wowed by polychrome mosaics, the sarcophagus of the triumph of Bacchus, the unique Gallic Coligny calendar, a plan-relied of the ancient town, a rare circus mosaic, not to mention the Tabla Claudiana, reproducing a speech by the emperor Claudius, all set inside an avant-garde architectural experience whipped up by Bernard Zehrfuss. Opened in 1975, Savay-Guerraz drives this municipal submarine, whose running is shared with the ever-so-stunning archaeological museum of Saint-Romain-en-Gal, half an hour down the road. As well as displaying its own permanent collections of Roman, Celtic and pre-Roman material (inscriptions, statues, jewellery, everyday objects), the Lyon Gallo-Roman Museum is home to many temporary exhibitions throughout the year. Archaeology and architecture buffs will be in their element – guaranteed. As for kids, the older ones will love it. It’s not interactive enough for little ones. Visitors can tiptoe over a 100m mosaic, telling tales of barbaricaires – weavers of golden threads – and soap makers, two original crafts alive and kicking at the time. 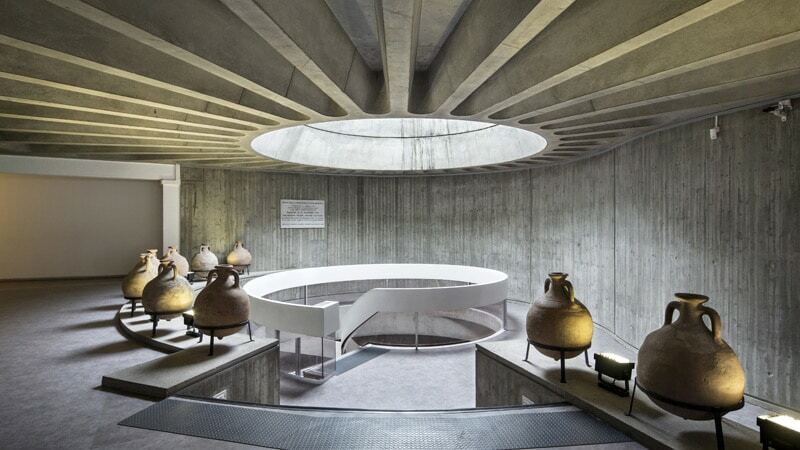 A little further, find fish sauce, wine, olive oil – delicacies locked tight in amphoras – as visitors uncover the tantalising products transported from the Mediterranean to the Rhône and onwards to the north of the Empire. Back in the 30s, archaeologist Amable Audin spoke of the importance of creating a museum to house the multitude of Roman discoveries unearthed in Lyon (the Claudiana table being the most majestic find). In the 50s, Audin managed to persuade celebrated Lyon mayor Louis Pradel to build a museum. However, the first project proposed by architect André Donzet was a flop, branded too neo-classical – given the presence of the Odeon – and was rejected by the General Council of Architects. Bernard Zehrfuss’ name then came up. Already sporting an international reputation and experimenting innovative methods, Zehrfuss wanted to implement his “homage to the invisible” idea – incorporating architecture into a pre-established space to create harmony and a quirky co-existence. This “underground concrete cathedral” that is the Gallo-Roman Museum was thus created by slicing into a natural hill, opening up an underground space, popping the skeleton with its concrete spiral ramp and floors inside, before being buried once again with soil and landscaping. Viewed from the Roman amphitheatre and Odeon, only the two square-ish tunnels – like two eyes – give any clue that something is lurking in the hillside greenery. 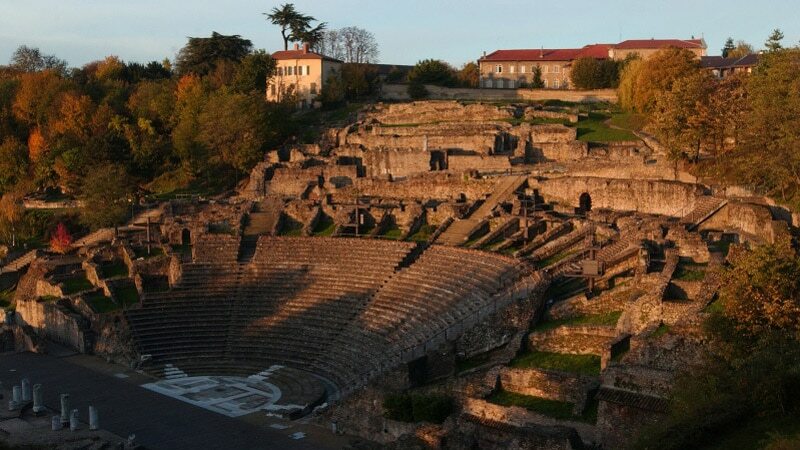 The Roman amphitheatre, just opposite the museum, is one of the oldest in all of Gaul, which along with the Odeon forms a rare archaeological couple, the only other one being in Vienne. With the capacity to seat 10,000 spectators, the place comes alive when the Nuits de Fourvière is in town – a yearly concert that lasts a whole month, attracting internationally-acclaimed artists and herds of music lovers. When it’s not concert season, the amphitheatre is a place of quiet contemplation. People sit on its steps and read books, kids kick balls, and people wander and imagine. As for the Odeon Pavement, it was composed of the most extravagant coloured stones in the Roman world: green porphyry from Greece, red porphyry from Egypt, yellow marble from Africa, and violet and red marble from Asia Minor. How about that. The presence of such materials is without a doubt an indicator of the monument’s prestige. 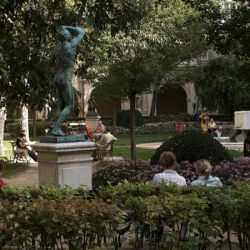 So take the Amphitheatre, the Odeon and the exquisite Gallo-Roman museum, add them to the surrounding rose gardens, columns and green, green grass, and what you get is a place seeped in history and atmosphere, making it one of the most delightful spots to unwind in Lyon. Well, provided that you avoid the occasional army of school kids, of course. Wander through to the rose garden, sit on a bench and get stuck into a good thriller. Or Roman romance. Snack in the best bakery of Lyon, La Boulangerie de St Just. Big cushions, impeccable design and uber-friendly, what better way to nibble a favourite French patisserie? For visitors age 18-25, large families (3 or more children), groups of at least 10. Your ticket allows access to the Museum’s permanent collections. For school groups, disabled persons accompanied by 2 guests, children under 18, the unemployed, and RMI beneficiaries. Thursday: Free museum entrance for all guests. On foot: Take the Funiculaire railway from Vieux Lyon and get off at Minimes.